Rowley’s View & The Shonk Associated With Council’s Introduction Of The Zones! It all academic! 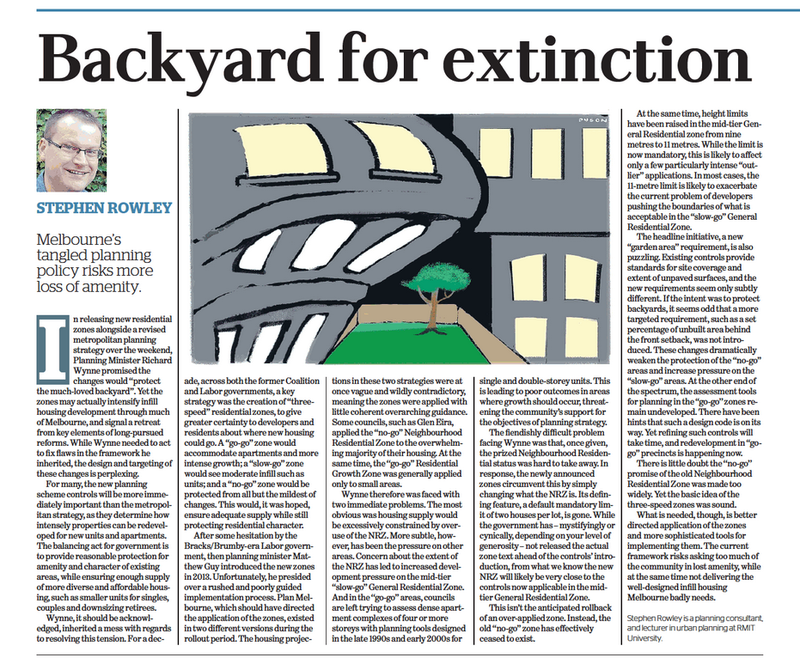 the developers will get it all in the end, because this is what Australia is, and has always been, a colony to exploit real estate infinitum, and a multi- national’s paradise for reaping profits on our natural resources. Of course all this exploitation is done tax free, or better still often subsidised by the people that actually do pay taxes. The Lib, Lab politician’s job is to make sure this continues to happens. otherwise their aspirational hopes get axed, and any hope to get preselected for a blue-ribbon seat and hence the gravy train, for a life of ease, silver service, chauffeured cars, with no job description coupled with little to no oversight. In such a corrupted system where do you think the average person’s concerns come in the rank of kow towing behaviors to the big end of town? At last there is some public acknowledgement of how corrupt the introduction of the zones was in 2013. I only regret that those responsible can’t be punished in some formal way. The good point about this is that with some luck it will stop the Hyams and Magees of this world talking about “extensive community consultation” and how the planning scheme is the residents planning scheme. If it shuts them up then I’m satisfied. Plus an apology would not be too much to ask for. The whole process was dodgy. We still don’t know who actually requested C110 and who wrote it, and why it was acceptable to rely on 20-year-old data and an unpublished “strategic” report. Council claimed it had an 85-year supply, and now the Minister will impose on us further relaxation of amenity standards. The alleged “fact sheets” are abysmal. Somehow we’re to believe greater certainty is a good thing when all that is happening is that more and greater intensity of development will be granted permits. Far from leading to greater “diversity”, which neither MRDAC nor State Government could be bothered to define, the new rules actively promote multiunit development at the expense of all other housing forms. With no minimum lot size and no need for gardens if you subdivide to less than 400sqm, the future is indeed clear. I certainly won’t be voting Labor at next election based on this effort. When and where was that slap on the wrist published? A link half way down the page will take you to “Advisory Committee Report”. Thanks. Has it only just been made public? We believe it coincided with the press release, but stand to be corrected on this. Found all this while I was searching. I’ve had a very quick look at some of these and they raise more questions than provide answers. The part that is the most disappointing and needed the greatest changes are the growth zones and Wynne has decided not to touch this. That means more 4 storeys with no open space and loss of amenity for residents and more streets going the way of Bent and Elliott. No mention either of changing the rescode guidelines or looking at commercial. It is giving developers even more scope to ruin suburbs. Trying to be positive with regard mainly to the GRZ. My interpretation could be out of whack but ignoring subdivision possibilities, the garden space thing could potentially play out ok in some respects. The nonsense of reverse-living adjoining town houses reliant on balconies should be nipped in the bud. The relaxing of the NRZ regulations will presumably open up a lot of opportunities elsewhere and see other Councils forced to take some of the load of a certain type of housing. Don’t believe you can “ignore subdivision possibilities”. Say you’ve got a 600sm block. Before in nrz it meant subdividing into 2. Now there’s no limit and with no minimum lot sizes anything could go there. That could also mean a 2 storey apartment block of say 10 to 12 boxes. Nrz will fact become the defacto grz. BTW council is already giving permits to land that is 179 sm. This will suit them down to the ground. Well, there had to many reasons for Newton shooting through like a skunk with his tail on fire. 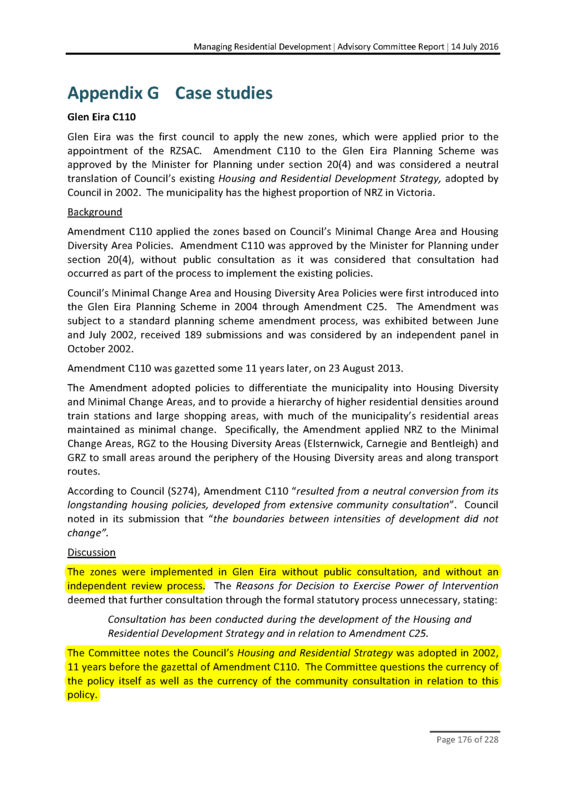 Appendix G. goes some way to showing his perfidy, but this doesn’t let the kowtowing councillors of the hook one iota. It makes one’s mind wander, and think what they got out of this treachery. I’m guessing Newton knows, and that’s why the likes of Hyams, Magee will go on and on with their cover-ups until their sad and sorry B/S excuses are lost to history. There must be a very good reasons why these two people were re-elected! They both did a fantastic job to support their respective political parties in the state government. You need to salute them as the developers are loving them and as well as the political parties they back. Can someone please prepare a Pie Chart showing developments in three wards after the new residential zones came into effect?